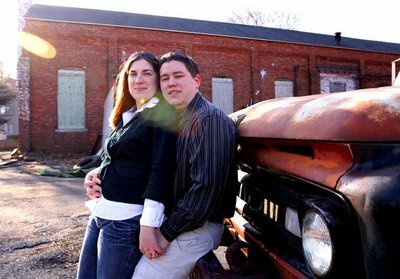 ...you are hired to take an engagement photo of the kid you used to babysit! I knew CJ way back when and now, he and Amy are getting married! I'm new to the whole engagement photo thing, but not the whole portrait thing. It was fun to photograph them though it was extremely cold (What is this - New England? Sheesh!). We would take a few shots then hustle into their house for a few minutes to thaw out before heading back out again. Here are a few of my favorites.